We love photographing Indian weddings! The vibrant colors and the emotional and meaningful traditions are always a joy to shoot. 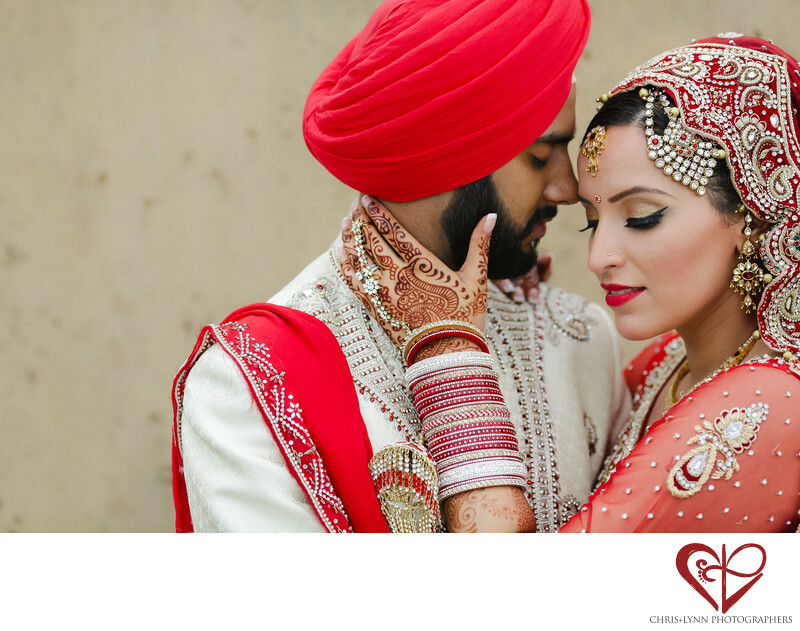 Showcasing the intricacy and detail of the couple's traditional Sikh wedding outfits as well as their very intimate connection to each other is the purpose of this image. So much effort goes into selecting the lehenga - this one was purchased in India and brought back to Vancouver - and into the makeup and henna. As well, each element of the bride and groom's outfits has cultural significance. So much of photography is selecting a background; unlike our signature environmental portraits, for this image we wanted as neutral a setting as possible to keep the focus on the couple & their attire. We wanted flat, even lighting to allow the reds to pop and gave some guidance in terms of arm placement to feature the different elements of the bride: the choora bangles put on her arms by her brothers, her elaborate dupatta covering her head, her bejeweled earrings and nose ring, and her kaleer, the ornament hanging from her wrist. For portraits like this, we will often ask the couple to take a deep breath and each think of their favorite moment during the ceremony or their favorite quality about each other, or something else that will allow them to have a moment of peace & connection together after all the craziness of the day so far. 1/1600; f/2.8; ISO 400; 135.0 mm.